Herbal anti-breast disease is formulated to seek out the root of breast disease and engineer correction. Frequently, breast disease such as breast cancer ocurr because cell immune activity had been reduced leading to death of breast cells. By supplementing immune activity, mammary cell cell repair can begin at the gene level. This will help regenerate mammary cell activity to counter the actions of breast disease. All of this will happen with no side effects and no damage to bone marrow or interference with existing immune system functions. It has no side effects on the liver or the kidney. Improvement can be noticed in as little as 60-90 days after using herbal anti breast disease regularly. This product is considered a breakthrough treatment for countering long-governing refractory brest disease with the good prognosis of non-recurring issues. 3-bottle pack of 60 capsules/bottle. One bottle of 60 capsules. Product ingredients include Lucid Ganoderma, Radix Astragali, Barbary Wolfberry Fruit, Dogwood, Donkey-Hyde Glue, Rhizoma Gastrodiae, and other herbals. 100% herbal plant extract that will not harm your system. Helps strengthen immune system to combat breast disease. 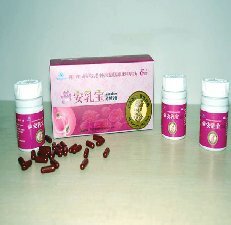 Can help to rebuild breast cells damaged by disease. Can show results in as little as 60-90 days with regular use.